How do I Choose the Best Kitchen Cabinet Lighting? Fluorescent lights can be placed under a cabinet. Puck lights are small, round lights installed underneath cabinets, that focus light on the countertop below. Kitchen cabinet lighting can be a nice touch to nearly any home. Whether you are trying to add class to your kitchen or simply set it apart, this type of lighting can help. Before making a decision, you should consider what the intended purpose will be, how reflective the countertops are, and the amount of energy you want to use. 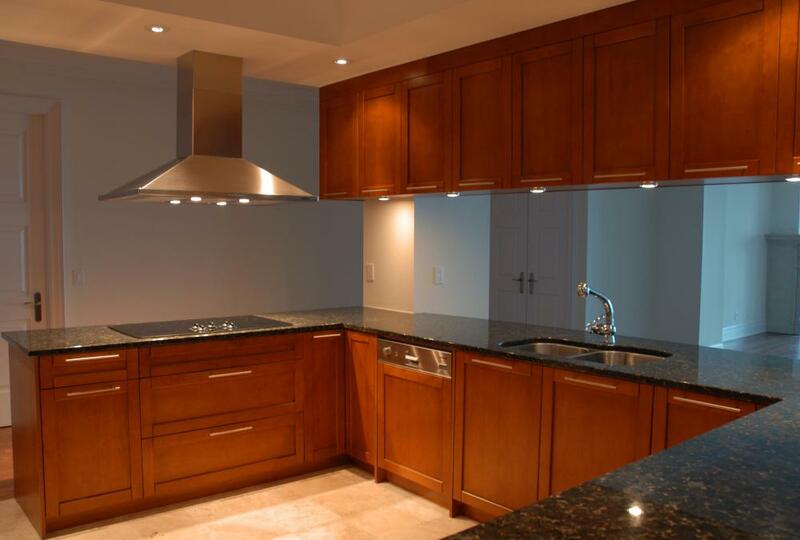 One of the main types of kitchen cabinet lighting is the under-cabinet type. This type usually is best for illuminating the surface under the cabinets so you can perform tasks at night, including cleaning the kitchen and getting a midnight snack. With this kind of kitchen cabinet lighting, you will likely not have to rely on major fixtures or the illumination from your refrigerator to see in your kitchen at night. Under cabinet fixtures can either be attached directly to the wall under the cabinet facing out, or affixed to the bottom of the cabinet facing the counter. The other common type is in cabinet lighting which is typically installed for aesthetic reasons rather than practical ones. Such lighting is often best to allow guests to see the contents of the cabinets, though it can provide some illumination in the kitchen, as well. In-cabinet lighting usually comes in the form of either a puck, which provides a harsh circle of light, or a strip of lights that create a gentler glow. Fluorescent under cabinet lighting and pucks inside the cabinets were quite common at one time. The popularity of shiny countertops made of reflective materials like granite and marble has reduced the demand for bright kitchen cabinet lighting that appears to nearly blind viewers. Instead, usage of lower voltage bulbs like xenon has helped to reduce glare. Frosted glass fixtures in place of clear glass have also helped. Considering the environmental and financial repercussions of high-energy use, many homeowners now prefer to buy only bulbs that require little energy. Fluorescent and incandescent bulbs are now often replaced with lower-voltage LED lights. Xenon bulbs have also increased in popularity, particularly among homeowners who plan to leave their kitchen cabinet lighting on all night. There are likely more things to think about when selecting cabinet lighting than most people think. While you should not completely ignore budget constraints, keep in mind that most kitchen cabinet lighting falls within the same price range. This means that you do not need to base your decision solely on the initial costs. How Do I Choose the Best Fluorescent Kitchen Lighting? What Are the Different Types of Kitchen Island Lights? What Are the Different Types of LED Kitchen Lighting? What Are Granite Kitchen Cabinets? What Are the Best Tips for Keeping Clean Kitchen Cabinets? How do I Choose the Best Fluorescent Fixtures? What is an Unfinished Kitchen Cabinet? LED's really don't do it for me, light wise. I have two stick-ons, with 15 LEDs each and there is no comparison to the xenon lights. Unfortunately, the xenon strip I have is no longer available so I couldn't link another to the existing fixture. I decided to try the LEDs, but I am disappointed. When we remodeled, we got some under cabinet lighting for our kitchen. We chose to go with the xenon type bulbs, just because we thought that would give the best look given the rest of the kitchen. The article is right, though. You really shouldn't have to take cost into consideration when choosing your lighting, since everything is about the same. What I really like most about our lighting is that there is a little switch on it that allows for a couple of different lighting options. One of them turns the lights off completely, one option makes them motion activated, and another turns them on constantly.
. Usually we just keep them on motion activated, since we know the kitchen well enough to make it to the counter without running into anything. If we have visitors staying, though, we can turn them on completely to help them find their way if they need a drink at night. The lights also are bright enough to sort of serve as a night light to help people find their way to the bathroom, as well. @matthewc23 - I believe you are in luck. I have been looking for something like this, as well. What you can buy are small, self-adhesive LED lights that just stick under your cabinets. The lights themselves are pretty small (maybe about the size of a 50 cent piece). There are several different styles and colors to match your decor and give you the desired light color. Most of the ones I have seen are battery powered, and you can find ones that are either motion sensing or manually controlled. The best part of all is that they are relatively cheap. I think the ones I am going to buy come in a set of three for less than 30 dollars. The fact that they are LED lights also means that the batteries in them will probably last a very long time, so I doubt that is a concern. I think it would be really nice to not have to fidget for a light in the dark. Usually if I get up in the middle of the night to go get a drink, or if I am just trying to find a snack or something, I usually just turn on the light above the stove. That isn't really ideal, though, since the way my kitchen floor plan is laid out, I have to walk several feet to get to the stove. I know at kitchen and bath stores, I have seen cabinets that come with the built-in lighting. Is there any way that you would install your own kitchen cabinet lighting without getting new cabinets? What sorts of options would exist for that, and how much would it cost to have installed? @sunshined - I am almost certain that I have seen cabinet lights that are motion activated. I guess I never really thought about it until I read your post, but I could see how that would be really handy to have lights that would only come on when you were around. In my sister's house, they just remodeled their kitchen and got kitchen cabinet LED lights. I really like the way they look. When she told me about them, I expected kind of the harsh blue LED color, but they are almost the same yellowish color as an incandescent bulb, which really makes it look good. They installed off-white backdrop tiles above the counters, so it really adds a nice look when you go into the kitchen at night. After seeing my sister's new kitchen, I am actually thinking about installing some new cabinet lighting of my own. @honeybees - I have several open cabinets in my kitchen that have lights in them. It did take me awhile to come around to the open cabinet look, as I didn't know for sure if I really liked it or not. My friend has them in her new kitchen, and really likes them, so she kind of talked me in to it. Now that I have gotten used to them, I really like them and I love having the lights inside them. When I don't want to turn on the lights in the ceiling, I can see well enough with the lights inside the cabinets. be neat if they had some kind of motion light you could install inside the cabinets. This way they wouldn't come on until the door was opened. This would take away from the nice atmosphere the lighting provides, but might help save on some utility bills. Does anyone know if they make motion sensor lights for cabinets like this? When we remodeled our kitchen a few years ago, I think I looked at hundreds of kitchen plans. One thing I knew for sure that I wanted was under cabinet kitchen lights. Not only do these lights add a nice touch to the kitchen, but really come in handy in the middle of the night. When someone needs to get a drink or find something in the kitchen at night, it is like having a nightlight that is on every night. You don't have to worry about turning on the bright overhead lights to find what you need. They also add a nice glow that make the kitchen warm and inviting. get a snack in the evening after the kitchen has been cleaned up, I can see well enough that I don't have to turn on the other lights. I haven't seen any difference in the amount of our electric bill since we had these installed either. This is one improvement that I have been really happy with, and it really didn't cost very much. If I hadn't gone with the under cabinet lighting, I probably would have tried lights inside my cabinets. Does anybody have lights like this, and how do you like them?